Digital archives offer users and archivists new approaches to storing and accessing archival materials. The benefits of digital archives include the possibility for instant global access to a collection, greater search capabilities and more user friendly interfaces. However, deciding when it is appropriate to invest in making a new digital archive or when a preexisting traditional archive or collection should be transferred into a digital format can be a trickier problem for institutions and archivists to solve. Time, money and staffing resources are all needed to transform traditional archives into digital archives. Furthermore some articles in an archive may lend themselves better to being presented in their physical state (three dimensional works, such as sculptures or furniture) and others may have originated in a digital format, therefore making them expensive or time consuming to recreate in a physical format. The massive amount of born-digital data that has been – and continues to be – created also poses a unique challenge to institutions and their archives. Although the traditional means of archival processing, storage and display are not intrinsically faulted, the desire to keep born-digital collections or articles in their original formats is aligned with the long history of archival processing and traditional approaches to archives. The inclusion of born-digital data in archives has already begun to bring significant changes and innovations to archival approaches and research methodologies. Archivists and software engineers at Emory University chronicled the institution’s first foray into digital archives in the article A Comprehensive Approach to Born-Digital Archives, as featured in the journal Archivaria. The acquisition of the author Salmon Rushdie’s archives at the Manuscript, Archives, and Rare Book Library (MARBL) of Emory University included four of the author’s computers and a hard drive containing files from a fifth laptop. The procuring of these devices lead to the creation of Born-Digital Archives Working Group who took on the challenge of figuring out the best way of presenting and preserving the information held within the computers. The group was also responsible for ensuring that Rushdie’s need for privacy was respected (the author gave the entirety of his files to MARBL, including sensitive financial information and personal documents regarding his family). Additionally the Born-Digital Archives Working Group worked closely with the team of archivists working on Rushdie’s physical archives. It was important to both groups that the two archives be complementary and referential of one another. The professionals who made up the project’s Born-Digital Archives Working Group came from two different professional backgrounds: three of the six were archivists from MARBL and the other three were software engineers. Due to the group’s diverse perspectives and professional skills, the Working Group emphasized an agreement on a unified mission and a clear set of desired outcomes. They agreed that the archive would be a hybrid – of physical and digital artifacts – that would be housed and accessible only in the MARBL reading room in order to honor the needs of the archive’s donors. Furthermore the group was dedicated to providing an authentic research experience for visitors and researchers. The group accomplished this by duplicating Rushdie’s hard drives and employing an emulation software on them. Through the use of an emulation the group was able to recreate Rushdie’s original computer workspace exactly as it was, with the exception of the restricted files. When a researcher engages with the workstation available at the MARBL reading room she has three different access points to the information included in the collection. The first is the option to work using the emulated computer which allows for the unique experience of seeing the files exactly as Rushdie saw them, including the same error messages and file names. The second option is a keyword search of a database holding Rushdie’s electronic files. 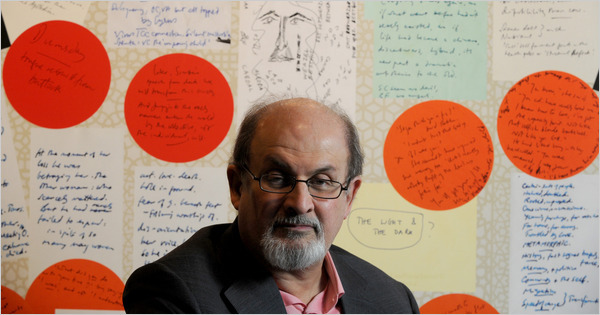 The final access point is the traditional finding aid, which includes descriptions of the complete (physical and digital) collection of Rushdie’s papers. The digital archives of Salman Rushdie at MARBL represent many of the positive and exciting aspects of digital and born-digital archives. Due to the nature of needing to limit the access of certain files, the collection now includes three copies of each of Rushdie’s computers in order to ensure the legacy of the collection in all of its different formats. The ability for researchers to have an insight of Rushdie’s own organizational process through the emulator is another exciting aspect of the digital collection. Furthermore the implementation of keyword search across digital files gives researchers and visitors new browsing capabilities within Rushdie’s collection. Although they embody many of the unique and exciting aspects of digital archive, the Rushdie archive at MARBL does not include global remote access to the collection. This decision was made by the working group in order to ensure that donor privacy and special needs were respected. Although global access will remain off limits for this project, it is easy to imagine the interface working through an online portal, as hopefully many later digital archives will be. The Born-Digital Working Group culminated their work on the Rushdie archive by evaluating their process throughout the project. Major points that the group focused on in their conclusions included: the need for collaboration between professions; the need to engage with multiple fields and communities; the importance of consultation with donors before the creation of the archive to ensure that sensitive information can easily remain restricted or removed from the public viewing audience, the importance of triage and appraisal; the value of collection-specific processes and workflows; and the need for tool development across professions and fields. When considering Emory University’s successes concerning the Rushdie archives, it is also important to consider the barriers that currently prevent other institutions from attempting to create their own hybrid digital archives. During a symposium on digital archives, Ricky Erway – a senior program officer for OCLC – discussed approaches and obstacles to the creation of new digital archives and the transformation of traditional archives to digital archives. Erway and OCLC began their research into the adoption and maintaining of digital archives with a survey of 164 college and university libraries. When asked to describe the nature of their digitization program 78% reported that they had completed one or more digitization projects, 52% said that they have a library-wide program currently active, 22% said that they could only take on digitization projects if they received special funding, and a surprisingly small amount – 3% – had no projects lined up or completed yet. These statistics show that institutions certainly have a desire to move towards digitization programs and projects, and many even have enough understanding of how to do so to have completed a digitization project. Therefore it is not a lack of interest in digital archives or a skepticism towards them that prevents more institutions from digitizing their collections, and the number of sampled institutions not currently involved in digitization efforts is remarkably small. Born-digital materials present uniquely different challenges to institutions than digitization programs. Although respondents to Erway’s questions overwhelmingly reported having born-digital materials in their collections, how to share these materials with researchers or the greater public lead to a variety of complications. Copyrights, a lack of staff training, lack of funding, lack of time, a lack of administrative support and finally, even a lack of formal responsibility for born-digital materials within an institution were all impediments to born-digital activity. Another major complication when considering the creation of a born-digital archive or digitization project in general is space. Although digital archives take up less physical space than traditional archives they can be expensive to host and maintain. In order to guarantee the safety of digital archives it is necessary for their to be a certain amount of redundancy included in the plans for the archive. Although the adoption of digital archives include serious challenges to institutions financially and potentially legally (if shared online) the benefits of digital archives and their inevitability in our increasingly digital world make them a necessary consideration for all institutions involved in archives and special collections. In many ways digital archives embody the key goal information science: to make information accessible and easily locatable to those who are seeking it. Luckily there are a variety of different ways of approaching digitization projects. Institutions who have an interest in creating a small online presence for their archives might chose to highlight a small, highly curated collection of their finest artifacts. Alternatively they might chose to do so only within a particular collection. The opposite of this is a goal of digitizing an entire collection or an institution’s entire holdings. For collections somewhere in between these two extremes there is the option for scan-on-demand, which guarantees that the documents begin digitized are being accessed. If funding is a problem it is also possible for an archive to provide a fee for access to the collection or a pay-as-you-go fee based on each document. The flexibility of digital archives, their ability to be shared online or exclusively through collection reading rooms, modern keyword search capabilities, the inclusion of metadata, emulated digital workspaces and the ability to present documents in their original digital formats, as well as the increasing amount of born-digital documents being created all point to the necessity of digital archives. When considering a digital project it is important for institutions to include redundancy in order to ensure the safety of their archival holdings, to take note of donor requests and copyright laws, and to remember to reach across professional boundaries in order to create not only good archives but beautiful and useful digital spaces. Carroll, Laura. “Archivaria: The Journal Of Canadian Archivists.” Archivaria: The Journal Of Canadian Archivists. 72.Fall (2011): 61-92. Print. Erway, Ricky. “Defining “Born Digital”.” OCLC Resources. OCLC, n.d. Web. 30 Oct 2012. <http://www.oclc.org/resources/research/activities/hiddencollections/borndigital.pdf&gt;. Erway, Ricky. “Columbia Journal of Law & the Arts.”Columbia Journal of Law & the Arts. (2010): 37-42. Web. 30 Oct. 2012. <http://www.law.columbia.edu/kernochan/symposia/digital-archives&gt;. The one issue I’m going to bring up just the looseness of the term digital, and how it can be applied to almost any situation where libraries, archives, or museums will work internally or with other institutions make archival material available online. I see smaller special collections libraries probably having to find that one perfect collection to digitize in hopes of gaining either more grant money or that all so important boost in physical users. http://newarkwww.rutgers.edu/IJS/JazzGreats0.html. These are more web exhibits based on the works of famous jazz artists, but in now way are these ‘exhibits or digital archives’ comprehensive to what they have on these artists. I guess they’re are just mini-showcases of what IJS as an institutional collection has and maintains. I’m interested see the future of archives as a whole, and how the effects of technological immediacy will force them to physical downsize. BTW I saw the NYPL Salman Rushdie talk on TV a couple of weeks ago. It was really insightful. He jokingly remarked how terrified he was to see that even his small notes scribbled would be available one day for future generations to pore over and examine.